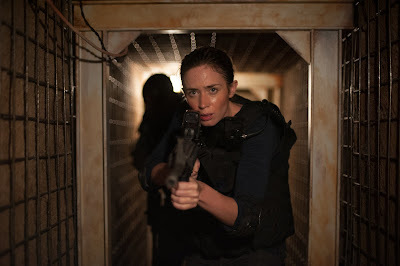 After a gripping opening that has she and her partner Reggie Wayne (Daniel Kaluyya) storming a Mexican drug lord's safe house in Arizona, Kate gets recruited by Department of Defense advisers Matt Graver (a typically brash Josh Brolin) and Alejandro Gillick (Benicio Del Toro) for a high-risk CIA-led drug operation across the U.S.-Mexico border. The team is following a bloody trail that leads to drug kingpin Fausto Alarcon (Julio Cedillo), who it is revealed brutally murdered Alejandro’s wife and daughter. Kate learns this following a raid of the cartel's secret cocaine-smuggling tunnel that runs beneath the border - one of several stunning, standout set pieces on hand.